Use the month of November to re-connect with yourself, with the world around you, and with the people in it, through gratitude. Take 2 minutes each day to scan through your routines, experiences, interactions, and acknowledge three new things that you are grateful for and why. If you have the time and space, write them down — translating our thoughts into concrete language makes us more aware of what we are actually thinking and deepens the emotional impact of those thoughts. Who has made a positive impact on my life recently? How did they make that impact? Why am I grateful for them? Feeling ready to get started? We’ve got one more thing for you! 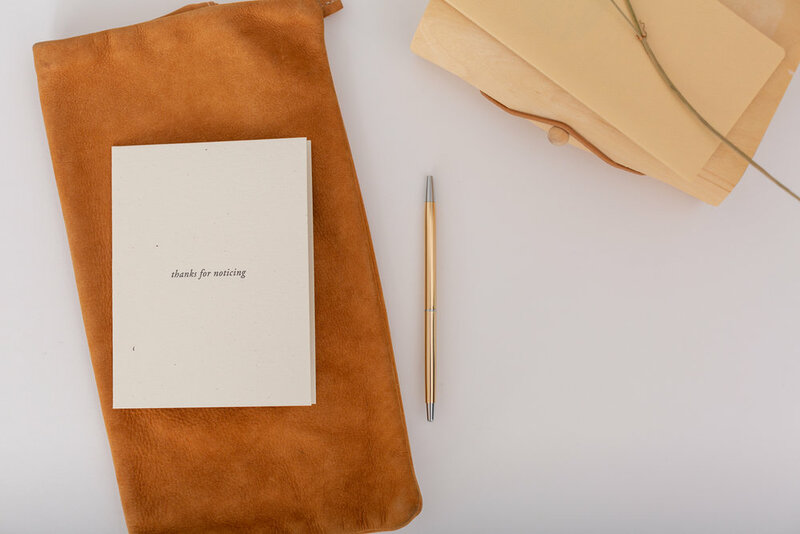 Volume 1 of Sincerely, our quarterly care package, was designed entirely to support a gratitude letter writing practice. We’ve curated 8 cards perfect for expressing gratitude, provided 8 postage stamps, shared guided meditations to support your writing (inside the pamphlet pictured above, included a letter ledger to keep track of the notes you write, and offered exclusive Of Note Stationers rewards available only to subscribers. Note: Volume 1 is only available in November! Shawn Achor insights were pulled from his interview with Dan Harris on 10% Happier (Episode 156), we highly recommend listening!